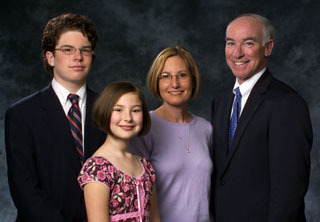 Since his election to the U.S. House of Representatives in 2006, Joe Courtney has served as an independent voice and tireless advocate for eastern Connecticut. Sent to Washington during the most trying economic period in a generation, Courtney has fought to protect jobs in the region and to expand opportunities for Connecticut businesses. Congressman Courtney has sliced through bureaucratic red tape, eliminating tariffs that have hurt local businesses and working to grow “Made in America” jobs. He was also the only member of the Connecticut Congressional delegation to vote against bailouts for major Wall Street banks. Courtney opposed the bailouts despite pressure from two presidents — one from each party — and sided instead with the working men and women of Connecticut. As a member of the House Armed Services Committee, Congressman Courtney has also fought to protect and strengthen eastern Connecticut’s status as the ‘Submarine Capital of the World’. When Courtney took office, for the first time in 50 years Electric Boat was not designing the next generation of submarines. Building just one submarine per year, the company was facing significant cutbacks, and the workforce — and regional economy — were in jeopardy. In his first term, Courtney secured seed money for EB to begin design work on new subs, and in 2011, Electric Boat will build a second submarine in a year for the first time since the 1980s. Courtney’s work on submarines has boosted businesses in Groton and New London — where EB is moving into the old Pfizer research complex — and means additional work and hiring as far away as Enfield. For his work in increasing submarine production, Courtney was named the Legislator of the Year by the International Brotherhood of Boilermakers, Iron Ship Builders, Blacksmiths, Forgers and Helpers. Working with his colleagues in the Senate, Congressman Courtney has also fought for SUBASE New London, securing more than $80 million in new military construction at the base to ensure that New England’s largest military installation will thrive well into the 21st century. Courtney has always worked in a bipartisan manner to get things done for his constituents. Honored as the Democrat Most Admired by Republicans while a member of the Connecticut General Assembly, Courtney has applied that same style in Washington. He partnered with 2008 Republican Presidential nominee John McCain to introduce legislation to help veterans and active duty military continue their public service as public school teachers. He also joined forces with Republican Congressman Ken Calvert to extend the tax credit for first time homebuyers, an important catalyst for our national and regional economic recovery. For his work on behalf of veterans, Courtney was awarded the Connecticut National Guard’s highest honor, the Meritorious Service Award. He has also earned the Connecticut VFW’s Legislator of the Year Award for 2009, the Patient Advocate Foundation’s Health Care Hero Award, and the Golden Triangle Award from the National Farmers’ Union for his efforts to protect the region’s dairy farmers and rural heritage. Prior to his election in 2006, Courtney represented Vernon in the 56th House District in the Connecticut General Assembly for four terms — from 1987 to 1994. During this tenure, he served as House Chairman for both the Public Health and Human Services Committees. Courtney is a 1975 graduate of Tufts University in Boston. He earned a law degree from the University of Connecticut School of Law in 1978. Courtney lives in Vernon with his wife, Audrey, a Pediatric Nurse Practitioner, and their two children, Robert and Elizabeth.